A cornucopia of well-designed magical items that won’t upset the game balance. A review copy of “Calpurnia’s 101 Lesser Magical Items” was provided by the publisher. Find more DMs Guild Reviews on my website and YouTube channel. I like almost everything about Dungeons & Dragons Fifth Edition with one exception. In making player characters more inherently powerful, magic items took a major step backward. They still exist but the game is much less loot-based than it used to be. And I love loot! The Dungeon Master’s Guide has a bunch of great loot to choose from, but one of the most requested features are more items that are less powerful. Since PCs are so strong, giving them any magic items in the lower levels can be a huge power boost that can wildly swing the level of balance. 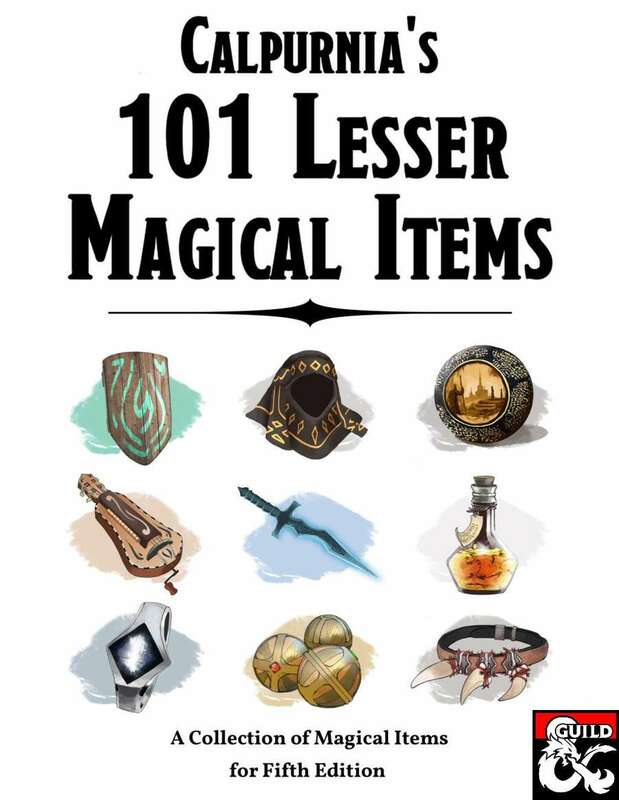 “Calpurnia’s 101 Lesser Magical Items” offers a nice solution by presenting dozens of magic items that are interesting and fun without upsetting the balance of low-level gameplay. Despite the self-imposed restriction there’s a ton of solid variety to be found. Everything from animated armor you can wear to over a dozen different magical rings. Some, like the Cloak of Colors, are simple little items that offer barely any gameplay benefit – like shifting colors, but can still be a lot of fun to the right players that have fun with them, and don’t ruin the game balance. Nearly every single item is listed with several optional variants that add different traits or attributes. The Blindfold of Truesight blinds its user, but grants them Truesight out to 30 feet, though the blindness lasts until the next Short Rest. Optional variants include Perceptive, which changes the Truesight range to 15 ft x your WIS modifier, and Active, which only grants Truesight if you’re concentrating (as if on a spell) but doesn’t blind you once removed. Most items also have a Cursed variant, adding some deliciously debilitating effects. With the above magical blindfold, it can be cursed so the blindness isn’t cured on a rest, but must be removed with magical healing. A cursed version of the Periapt of Wild Shape leaves its owner permanently in their beast shape form, unable to revert back. These variants add a ton of new uses and options for a compendium that already offers a ton of items. “Calpurnia” isn’t just a flavorful title either, she’s the in-character scholar and author of the guidebook, much like Xanather and Volo in the official Wizards of the Coast books. Her flavor texts are frequent – about one for every two items, if not more – and excellently written. They’re often humorous and insightful, cleverly suggesting ways in which certain items can and should be used. It makes the entire compendium a much more entertaining read. For a rare moment in a DMs Guild Review, I have no real complaints. If I’m being exceptionally nit-picky I could lament the plain white paper background, or the minimal amount of pictures. But none of that takes away from this very well-written compendium with enough content to delight any low-level (or low-magic) group. 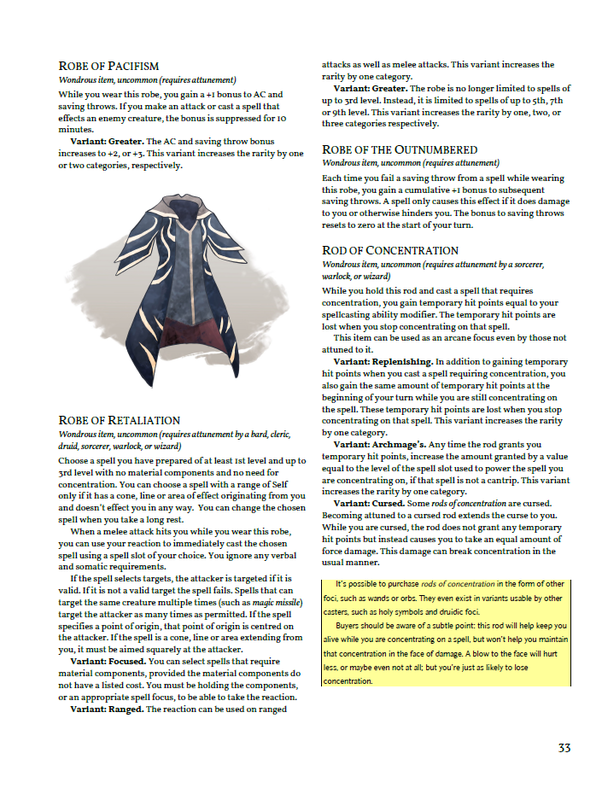 PDF Bookmarks for every single magic item entry. Many items actually care about a PCs skill level or modifiers. Every item has several variant traits that can be added for even more options. Calpurnia has a fun, college professor-like voice who makes insightful comments on items throughout the compendium. The Verdict: “Calpurnia’s 101 Lesser MAgical Items” is the perfect shopping list of fun, varied magic items for your lower level characters.